NOTE: We’re looking for more detailed and updated band bios. Please let us know if you find any. As singer, and half of the electro-rock band God Lives Underwater, David Reilly spent the 90’s as a producer, recording, and touring artist. He and partner Jeff Turzo were recognized by d.j. and eventual manager Gary (destructo) Richards via Josh Wink. God lives Underwater were first signed by Rick Rubin (slayer, public enemy, beastie boys, system of a down) to American Recordings (at signing was still known as “def american”)..
American went on to release GLU’s debut EP and album “Empty”, both emblazened with “executive producer Rick Rubin”, spawned minor radio and club hits “No More Love” and “All Wrong”, the former as a single from a Keanu Reeves film known as “Johnny Mneumonic”. GLU management Gary Richards then took a label deal with parent company A&M, and released a new Glu album amongst others under the “1500” moniker such as David Holmes, Ugly Duckling, and Jeff Turzos solo electronic EP titled “Mass Hystereo” (now quite a collectors item). The label formed with A&M was originally to be called “NITRUS”, After rounds of talks with GLU, Richards, and Richards then partner, an L.A. promoter, “NITRUS” became “1500 records”. “life in the so-called space-age”, co-produced and co-mixed by Gary Dobbins a.k.a. Master Frequency (rozz williams, gitane demone, tim harrington) their first AND last 1500 /A&M release,spawned a “size-able” radio hit, “From your Mouth”. The single enjoyed play on alternative rock stations and MTV alike, and saw the band to continue hitting the road for several years. Glu sharpened its teeth at seemingly every suitable venue, and radio festival in the country, and built a huge, rabid, and sometimes obsessive, fanbase. In addition to his extensive repertoire as a writer and vocalist, David is a multi-instrumentalist and producer with extensive synthesis/sampling knowledge, and with his GLU partner Jeff Turzo, stayed busy with other production and remix projects, including remixes for Skinny Puppy, Rob Zombie, and Messiah. Glu and Richards also organized and contributed to 1998’s “For the Masses: A Tribute To Depeche Mode”, which featured tracks from Deftones, Smashing Pumpkins, Failure, The Cure and Monster Magnet. 1999-2003 brought God Lives covering David Bowies “fame” for the film “15 minutes”, the death of Davids Fiance Seven in a train accident, the bankruptcy/merger of a&m, the bankruptcy of the company riffage, who had taken control of 1500 and the album by GLU to be called “up off the floor”, and the Marriage of Jeff Turzo. David released an electronic/instrumental album called “Robot Teen America”, and formed a traditional rock outfit called FLUZEE who released “the 7 EP” both of which were without company backing, and suffered consequences of such. 2004 saw the release of GLU’s anticipated “Up off The Floor”, which was released worldwide in June on Megaforce/Locomotive with a manufacturing flaw that to this day has yet to be resolved, making the product virtually unlistenable. 2004 saw David’s return to touring and his first foray into recording as a solo artist, with the Corporate Punishment EP “inside”, which has rare demo versions of 6 songs. During his first solo tour, He was backed by Ben juul (drums), and Dave Trusso (guitar), both members of the band “Everything ends”. Ben and Dave have been added as permanant touring players, and will most likely play on future solo Reilly releases. In late 2004, solo negotiations began between David and Ruff Nation/tri-media/universal the label out of philadelphia run by Chris Schwartz (the Fugees, Lauren Hill, Kris Kross, Cyprus Hill). Tragically May of 2005 Davids girlfriend Amy passed away, and Davids condtion made negotiations take longer than expected. Finally, officially signed to Ruff Nation and close to finishing his most concise work yet, things are looking up for the multi-instrumentalist/singer-songwriter. “how humans R(x)” is the tentative title for the full length album, and a marketing plan is being developed. With the team in place at present, everyone is very confident. David is handling all writing,playing,singing, and programming, and he is co-producing with omni-present Walt Bass. The personal manager is David Sherman. Live players include Dave Trusso and Ben Juul. Chrissy Bowden is the project Photographer, Thom Hazaert is the West Coast advisor and handler of other creative affairs, Kevin Foster is handling www.enjoyglu.com, and Chris Schwartz C.E.O. of Ruff Nation is personally involved in all aspects. Gary Richards is according to David, the reason he has a career. David Reilly started making music before he could remember. Yes, you read that correctly. David started banging on the piano and anything else that was put in front of him, at an age that most people have yet to acquire skills of recollection. By age six, he was unsure HOW he could play music, he just knew he always did. Picking up other instruments along the way such as drums, guitar, and bass, he managed to save his money for a 4-track recorder, and now singing and songwriting were becoming the focus. Needless to say, when somebody is playing 5 instruments, writing songs, and now learning the art of recording them around the age of 10, school and other aspects of life take a back seat. David had plans of being a recording artist when other kids were making the tough decision between fireman, police officer, and veterinarian, and his determination was unwaivering. High school represented the time in his life when selling tapes, that he dubbed at home, became a full-time job as well. These tapes started to build a sound that combined a lot of the 80s influences from the time with 70s rock feel, and an ever-present David Bowie undertone. After countless names, logos, images, and styles, David went to high school and met Jeff Turzo, giving birth to God Lives Underwater. By the age of 21 recording deals weren’t something he dreamt about any longer. Music mogul Rick Rubin saw, in God Lives Underwater, something he could develop over time, for a low risk, and foresaw “realistic” results. God Lives Underwater became successful in the electro-industrial scene for their sound, but GLU continued to strive to be recognized as a rock band for its songs, first and foremost. GLU enjoyed success with two albums for Def American, and one release on A&M. An almost unnoticed record at the end of GLU’s career was also released on an indy-conglomerate, but was released with no band in place, and suffered the consequences of no promotion. Bringing us to now… After common struggles that younger rock bands go through, and the also common struggles that record labels go through, GLU disbanded, or more appropriately, faded out, with both Jeff AND David wanting to pursue solo careers. GLU put out their last record “Up Off The Floor” on Locomotive/Megaforce in 2003, after the record sat in legal and monetary battle since 1999. During this time waiting for the record to come out, David began writing the demos which would become his first solo release tentatively titled “How Humans Are”, for RuffNation. These songs, focussing more on a “live” rock feel, are what David feels is the best way to present his songs. Walt Bass, a long time friend of David’s from high school is co-producing and engineering this record and highlights some things they both have wanted to do together for years. These songs also showcase some of the hardships that occurred along the way, and deserve a good listen as a testimonial of perseverance. GLU members David Reilly and Jeff Turzo grew up in Pennsylvania and began experimenting with music in high school. After making demos that fell into the hands of producer Rick Rubin, the band released their self-titled EP in 1995 and the follow-up album, Empty on Rubin’s American Records. After establishing an underground following through relentless touring, the band moved to A&M Records and released 1998’s Life In The So-Called Space Age. The breakout hit “From Your Mouth” established the band on alternative radio and MTV alike. After several tours with the likes of No Doubt and Sublime, GLU received critical acclaim for their unique sound. The band went into recording what would be Up Off The Floor sessions in 2000. After finishing the recording the band’s record company, 1500/Riffage, went under during the internet bubble-bust. Combine haunting lyrics with some of the most amazing songs ever written, and an arc that begins with despair and ends with “Positivity,” and you have a great album. In stores September 28, 2004. Jeff Turzo and David Reilly both grew up in small-town Pennsylvania, experimenting with computers and keyboards until one night in 1993, they decided to form a band around an industrial/techno song they had recorded for a party. The duo recorded four additional songs, and got an audition with Rick Rubin, president of American Recordings. Rubin liked what he heard, and signed Turzo and Reilly to his Onion subsidiary. They recorded a self-titled EP in 1995, then added guitarist Andrew McGee and drummer Adam Kary for live shows. 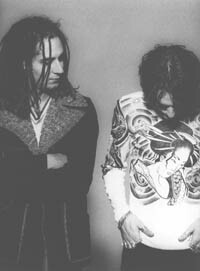 God Lives Underwater’s debut album, Empty, was released later that year, followed in 1998 by Life in the So-Called Space Age. Bedroom studio boffins extraordinaire Jeff Turzo and David Reilly are the duo behind the pseudo-industrial electrorock of God Lives Underwater. After playing in various teenage bands in their hometown of Perkiomenville, Pennsylvania, Turzo and Reilly joined forces in 1994 on a homemade demo tape that got the attention of American Recordings head honcho Rick Rubin, who quickly signed them, whereupon they moved to L.A. Their 1995 debut album Empty , more rock than dance, garnered some notice, but American’s financial problems soon put the band in limbo, from which they eventually exited by switching labels (to A&M). 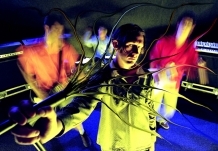 1998’s Life In The So-Called Space Age was a promising development of GLU’s sound and further demonstrated their debt to folks like Nine Inch Nails’ Trent Reznor and David Bowie. Turzo and Reilly also paid homage to another major influence, Depeche Mode, when they oversaw the Depeche tribute disc For The Masses (which included GLU’s own version of “Fly On The Windscreen”). In all honesty, though, Turzo and Reilly have a long way to go before they rate even a patch on the three previously named artists. For all their skill at getting cool sounds on disc, they are still an undistinguished live act, prone to generic sludge-rock tendencies that eclipse the entrancing electronic ambience they’re capable of concocting. They also suffer from a pronounced lack of vocal ability, and their songwriting could stand some improvement. But other than that, they’re fine.